Painless Delivery: Is it the Best Option for You? If you are anxious about labour, an understanding of painless delivery can go a long way towards providing peace of mind. You may be wondering if it’s really possible to have a painless normal delivery? Is it safe? What are its pros and cons? As an expectant mother, you deserve to get the guidance and support that will help you approach labour with confidence. Dr Anita Sabherwal, Consultant Gynecologist at Sitaram Bhartia Hospital in Delhi, provides answers to these and other questions. Painless delivery refers to the use of an epidural injection for pain relief during labor. 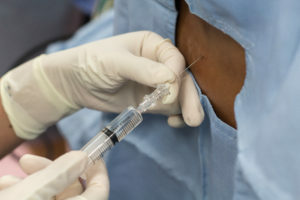 An anesthesiologist gives an injection in the lower back and places a plastic tube through which drugs are released around your spinal cord. “Epidural substantially reduces pain and sensations in the lower half of the body, but doesn’t always provide 100% pain relief,” says Dr Anita. “Also, the injection is given only once you’re in active labour – that is when you’re having at least 3 contractions in 10 minutes. “Epidurals are safe for the mother and baby” says Dr Anita. “When other forms of pain control no longer help, an epidural can provide relief from exhaustion and irritability. By the time Meena came into the labour room, she was exhausted even though there were 8-10 hours more before delivery. She had been having mild contractions in her abdomen off and on for over 3 days but her true labour pains had started only a few hours before. Meena decided to opt for painless delivery. Soon after the epidural injection, she fell asleep. Trying for a painless delivery has its disadvantages. Because an epidural has a numbing effect, you will not be able to walk around and be confined to your bed. Your labour may be longer. You may have difficulty urinating and need a catheter. You may be at higher risk for a forceps or vacuum delivery. Should you choose a painless delivery? “I counsel pregnant women to prepare for a normal delivery by building their stamina, practicing labour exercises and breathing techniques, and selecting a birth partner” says Dr Anita. “With the right support, most women are able to cope well with labour pain without needing an epidural. But some women – those with long labours or those with low tolerance for pain – can benefit from taking an epidural. This blog has been written with editorial inputs from Dr. Anita Sabherwal. She has an avid interest in General and High-risk Obstetrics.